Today we think of the Presbyterian Children’s Society and the ministry to those with leprosy. Over 150 years ago a small group of men formed the Presbyterian Orphan Society to support Presbyterian Children in a rapidly changing social situation. Now known as the Presbyterian Children’s Society it continues to regularly support almost 800 children within 400 families in over 200 congregations throughout Ireland. It also helps many more Presbyterian children by way of exceptional grants. The Society works through congregations of all sizes and has a capacity and enthusiasm for assisting others, which continues to make a difference to children’s lives. 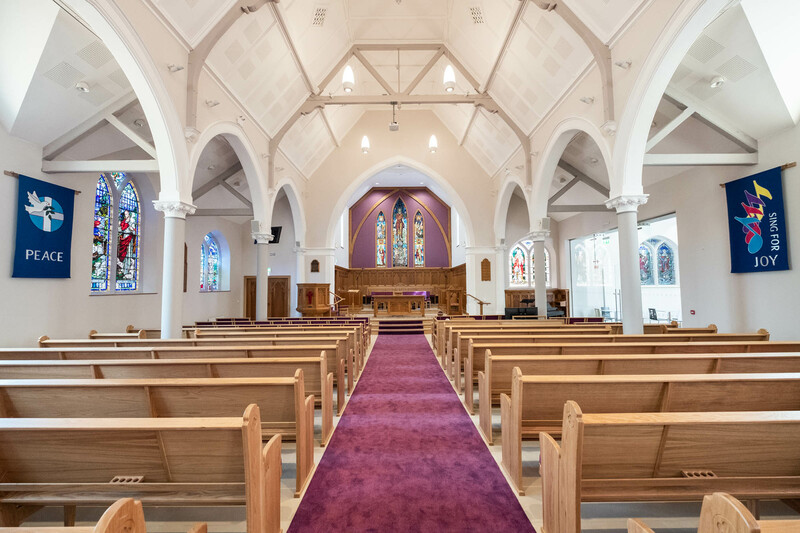 It is God’s guidance and the Society’s reliance on the Presbyterian community whose support remains undiminished through the years, that enables that work to continue. Many families have been supported financially at critical times, a small financial help up, not just a handout; can change lives and make a significant difference. So often today, just as in Jesus’ time, those with leprosy find themselves disabled by the disease, and disregarded by society. They are often driven from their homes, sent instead to live in leprosy colonies, out of the way of others. They lose their jobs, and are forced to beg for a living. I would like to share the story of Pankaj Kumar who has been helped by The Leprosy Mission. Pankaj has experienced both the physical problems and the social segregation which leprosy brings about. Diagnosed with leprosy 10 years ago, he suffers from clawed hands – when the muscles in the hands are weakened and shortened by leprosy. He could no longer close his right eye, and his feet lost all feeling, leading to many ulcers, and infections. Daily tasks have become a lot more difficult for Pankaj, but he has been greatly helped by the medicine, care and surgery that he has received, free of charge, from Naini Leprosy Mission Hospital. It was through Naini that he was put in touch with their community worker, James George. I met James on one of my trips to India and he took us to the leprosy colonies, he has become a great advocate of leprosy affected people. James has been working in communities affected by leprosy for many years, as well as speaking about leprosy in schools, working with local government officials, and helping families battling with the social impact of leprosy. James is very popular when he visits Pankaj’s leprosy colony. Everyone greets him with smiles, and wants to share with him their news. He is currently considering enrolling Pankaj into a Leprosy Champion training class. These monthly classes focus on human rights, leadership and advocacy. Pankaj and others will be given the confidence and the tools to challenge local governments about disability provision, fight for the right of leprosy affected children to attend the mainstream schools, as well as learning how to access grants and aid for vulnerable and disabled members of the leprosy community. The work that James is doing over a vast area, encompassing many different leprosy colonies and many thousands of people, can be done in a more concentrated way by Leprosy Champion’s, who can work daily in their location. The vision is to have James and other Leprosy Mission staff moving to a support role for Pankaj and other Leprosy Champions. This would increase the impact of the community programmes, and empower those who once were voiceless and powerless because of the stigma and segregation caused by leprosy. For Pankja, who was a teacher before losing his job after the school discovered that he had leprosy, this is an opportunity that he is passionate to take. Pankja tells of the daily discrimination and injustice that he faces, as he lives with leprosy in India. He tells of the experience of being helped onto a bus into the disabled section, only to be told to get off when the conductor realised he had leprosy, and being forced to get out of a taxi half way through the journey, again after the driver realised he had leprosy. By becoming a Leprosy Champion, Pankja is not simply getting a one-off hand out of help, but rather a hand up, so that his situation is changed over the long term, and he no longer will be treated unjustly. Pankja is looking forward to learning how to combat and challenge these daily battles in a constructive way, as well as fight for justice for other leprosy affected people, by helping them with their daily financial, social and educational problems. Pankja is one of many people who are left to battle daily with the stigma of leprosy. In India alone, there are over 800 leprosy colonies, with thousands of people living in them. There is an estimated 3 million people living with disabilities caused by leprosy across the world. The Leprosy Mission community workers like James do an amazing job, and help as many people as they possibly can, but they recognise that they need an army of helpers who will champion the cause of leprosy affected people. We lift before you today the work and witness of the Presbyterian Children’s Society. We are thankful for the founders of the Orphan Society many years ago and for the vision they shared in setting up the society. We are grateful for the support given by many congregations across Ireland and we pray that this will continue and encourage more congregations to get involved. We remember the families and children that have been supported by this work and the significant difference this has made to their lives. We pray for Leprosy Mission community workers like James, who are tireless and faithful in their efforts to help those caught in the poverty and oppressed by the stigma of leprosy. We pray for the leprosy colonies that they work in and for people who have been recently sent to these colonies following the discovery that they have leprosy. Help them to find provision, to feel welcomed, and to adjust to this new world. We pray for leaders of leprosy colonies and ask that you would grant them wisdom and resolve as they deal with difficult situations, and attempt to address many different needs within their community. We pray for people like Pankaj as they train to become Leprosy Champions. We ask that you would help Leprosy Champions to be effective in their work, and that as they engage with schools and local government, they would be positively received. We pray that through their role, the stigma and the injustice of leprosy would be effectively challenged. We pray too that many people would benefit from their knowledge of how to access much needed financial aid, for children growing up in leprosy colonies, we pray that they would have both the financial provision and the social opportunity to go to school, and that through this education they would be able to help break the poverty cycle that has trapped their family. We pray for a change of heart from local and national governments. We pray that they would have an open mind and listening ear towards the message of the Leprosy Champions, and that as a result, a change of attitude would occur towards those who have leprosy. We pray that you would help all those disabled as a result of leprosy. Be with them as they face the challenges of everyday life, and the prospect of rejection and abuse from people that they come into contact with. Help them to find the care and medicine that they need. Draw close to them and comfort them through the work and the witness of Leprosy Mission doctors, nurses, community workers, and counsellors. Help them to find hope and healing as they learn about the good news of the Gospel through the ministry of The Leprosy Mission. We thank you for the skill and dedication of so many people in caring for those with leprosy. We pray for your continued hand of guidance and blessing on The Leprosy Mission family. Direct the efforts of those who raise support for the work, and sustain the efforts of those who treat the illness and care for the patient.